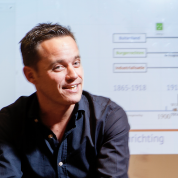 Jelmer currently teaches history at UniC in Utrecht. He was driven to become a teacher by his own educational experience. He describes himself as having been an average pupil who only came into his own with the encouragement of his economics teacher at the age of 17. Aiming to provide a holistic education to his students, he became a reformer of the Dutch education system and has been building an international teacher leadership network. He was nominated for the Dutch Teacher of the Year award in 2012. Jelmer has written two books – ‘The Alternative’, one of the most influential educational books in the Netherlands, and ‘Flip the System’ – outlining a modern alternative to the traditional system of test-based accountability. His teaching approach leads to student ownership of their learning and to the creation of a personal learning environment. In his history classes, Jelmer works mostly with interdisciplinary topics in which subject content and skills are acquired by students while exploring real-life challenges, and social media and gamification play a key role. His exam tools have been used by thousands of students nationally, creating a connected K12 MOOC.